Broken Hearts starts of with our MC Gemma being dumped by her boyfriend Teddy while at Target. Gemma thinks he will realize he has made a mistake and come to his senses, but after a run in with Teddy a few days later, it becomes abundantly clear that he meant business. Heartbroken, Gemma wallows in her room, crying at movies for a week with her BFF Sophie trying to console her, until her mother and stepfather tell her that they are going to Scotland for the summer, and she is going to The Hampton's to spend the summer with her dad. Armed with a new hairdo, a coffee with the name Sophie on the side, her BFF necklace with the initial S for Sophie and nursing a broken heart, Gemma arrives in The Hampton's. Her worst nightmare comes true when her train pal Josh's sister shows up to pick her brother up. When Gemma was 11, she came to The Hampton's with her dad, and became great friends with a girl named Hallie. Because of a personal situation in Gemma's life at the time, she ended up hurting Hallie deeply and almost destroying Hallie's family. She is scared to face Hallie all of these years later, so when Josh introduces her as Sophie, she decides to stick with the stolen identity, and try to make up to Hallie the only way she thinks she can; By pretending to be her BFF and befriending Hallie, to prove she isn't the same person she was back then. Gemma has mishap after mishap, but she seems to be gaining Hallie's trust, and she is hopeful that her plan will work. She also has a budding relationship with Josh, and her broken heart starts to heal. Things aren't always what they seem though, as Gemma learns by the end of this story. After the final fireworks, Gemma decides that the game isn't over. All of her hands haven't been played yet. The ending is definitely a cliffhanger, so be warned! 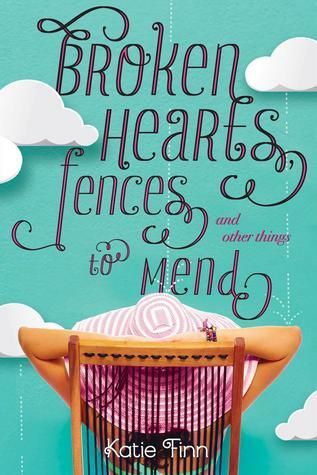 Broken Hearts, Fences and Other Things to Mend (too cute title!) is a cute, fun, sometimes funny story. I enjoyed it for the most part. It is not an earth-shattering, heart stopping, breath-taking story by any means. It is a fun, summertime story. There are most definitely good lessons to be learned, however. And for me, some eye-roll inducing moments. I will definitely check out the next in the series. It is really cute; A perfect Summer read!